Update: The FGGF3054MB model has been discontinued. The Frigidaire FGGF3058RB is a similar model with the positive features of the previous. 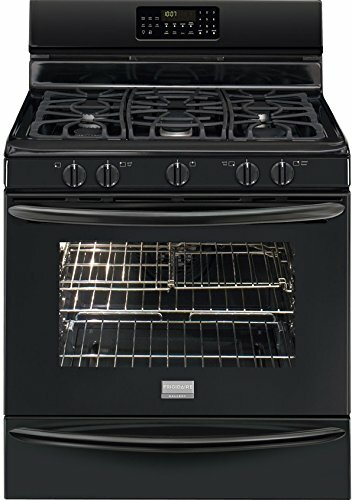 The Frigidaire gallery gas range FGGF3058RB is a 30-inch, 5-burner range and convection oven from Frigidaire’s Gallery Series. This gas range comes with a self-cleaning feature which will be a relief for anyone who knows the pains of spraying oven cleaner and using elbow grease to clean an oven. While it has only one convection fan the Frigidaire FGGF3058RB provides excellent heat distribution, making it possible for you to use more than one rack at the same time. It also has an in-built safety mechanism that shuts off the oven after six hours of non-use. This range has a fairly small profile and weighs 215 pounds which makes it fit in to most kitchens large and small. There’s no doubt about it, this black gas range is stylish. While fingerprint are more visible on black than on white, it’s definitely not a deal breaker. The fact that the surface is made of ceramic; it’s smooth which allows you to clean it with relative ease. Traditional coil element stoves are typically much more stubborn to clean because they are usually made of less durable surfaces. What is the difference between Frigidaire FGGF3054MF and FGGF3054MB? MB is the black model and MF has a stainless and porcelain finish. The updated RB model is also black. Convection cooking is all about the fan and its ability to distribute heat. A traditional oven has hot spots which makes them rather tricky to use, especially when you want to cook foods that need a steady temperature and good heat distribution. The fan in this convection oven alleviates this problem by circulating the hot air and transferring it equally. It's possible to broil food in the oven, but the unit doesn't come with a broiling pan. Of course you should make sure that the oven is clean before doing so since the high temperature can cause residues to catch fire and destroy the oven’s insulation. As you probably know, ovens are often hard to clean. Certain foods will create a mess and the interior design of some of these appliances can make the cleaning process quite a bit harder. The process is quite easy. It really is as simple as the press of a button. The button is labeled with “CLn” on it. However, it should only be activated when the oven is empty (no pots, pans, sheets, or food should be inside). The Frigidaire FGGF3058RB has a smaller profile than other gas ranges that’s ideal for most kitchen environments (33" x 34" x 50"). This range may great for a single person who loves to cook, but at the same time it will not be underwhelming if you have a bigger family or you are inviting guests over for dinner. Sure, you can keep your oven clean without using it, but it makes the cleaning process much easier, especially if you cook certain, “splashy” foods. Check out the owner's manual for full cleaning instructions to see how easy it really is. Keeping things organized in the kitchen is often an issue during and after cooking or baking. Having this drawer space definitely helps keep your baking sheets and pots in a place where you won’t forget them. This range has a full black design including the side panels. This may not be the most important thing, but the Frigidaire FGGF3058RB really is a beautiful oven. The black color combined with the ceramic cooktop makes it almost elegant (if an oven can be elegant). Ceramic cooktops are like that, they are as much of a disadvantage as they are an advantage. They certainly look amazing but you could burn yourself more easily if you are not careful because it tends to retain heat longer than metal or glass. Scratches and fingerprints show up quite easily on black ceramic. You will have to be careful if you use cookware that has rough a bottom as this will increase the potential for scratches. This could be a deal breaker if you need a range that operates fully on gas. This range needs electricity to power the oven and cannot be operated without it. The Frigidaire FGGF3058RB is a very stylish oven that doesn’t really have any gimmicky features. The full-black design is on point and makes this oven a really good fit for many kitchens. The convection oven is smooth and efficient and significantly reduces cooking time which is valuable not just because of the time aspect, but the shorter cooking times also mean that the food will not dry out as quickly.